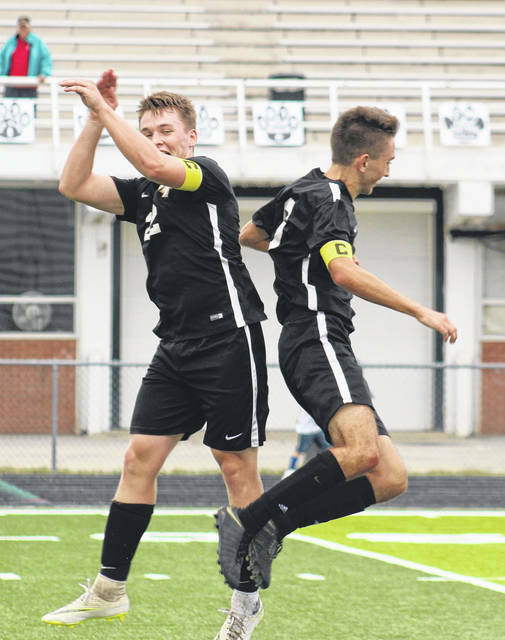 Drew Batson (left) and Caleb Perry celebrate after one of three goals on the night by Perry during Miami Trace’s 3-0 win over Hillsboro Tuesday, Sept. 11, 2018 at Miami Trace High School. The Miami Trace Panthers varsity soccer team hosted a Frontier Athletic Conference match with the Indians of Hillsboro High School Tuesday, Sept. 11. Miami Trace won the match, 3-0. Junior Caleb Perry had the hattrick (three goals) for the Panthers. The first goal was unassisted with 8:04 mark of the first half. The Panthers held a 1-0 halftime lead. With 38:29 mark, Perry drilled home a penalty kick to give the Panthers a 2-0 lead. Finally, with 11:23 to play in the match, Perry connected for another penalty kick to set the final tally at 3-0. Miami Trace had a player receive two yellow cards in the match. The Panthers played the final almost 30 minutes with 10 players to 11 for Hillsboro and still maintained the shutout. It was the fifth shutout of the season. The school record is seven in one season. The Panthers are now 6-1-0 overall with a match coming up Thursday at home at 5 p.m. against Jackson, another FAC contest. https://www.recordherald.com/wp-content/uploads/sites/27/2018/09/web1_Drew-Batson-and-Caleb-Perry-MT-boys-soccer-v-Hillsboro-9-11-2018.jpgDrew Batson (left) and Caleb Perry celebrate after one of three goals on the night by Perry during Miami Trace’s 3-0 win over Hillsboro Tuesday, Sept. 11, 2018 at Miami Trace High School.